Our latest one-day contact lens innovation – designed to provide exceptional vision quality and unsurpassed comfort. Optimised Toric Lens Geometry™ – delivering exceptional vision for your astigmatic patients. Featuring the same technology as our leading monthly replacement contact lens for astigmatism, Biofinity toric. Uniform horizontal ISO thickness – improves lens stability and reduces rotation for better visual acuity. Smooth, continuous surface – minimises lens movement during eyelid interaction for excellent overall comfort. Large toric optic zone – provides clear visual acuity. Optimised ballast toric design – less rotation for better vision stability. Smart Silicone™ chemistry – the science behind unsurpassed comfort. MyDay® toric lenses utilise Smart Silicone™ chemistry to deliver an exceptional patient experience. The technologically advanced silicone channels in the MyDay® material transport oxygen so efficiently that less raw silicon is required. This sustains inherent wettability and facilitates optimal water content. Long chain silicone – up to four times the Dk/t of some other hydrogel daily disposable contact lenses for a healthier lens-wearing experience. Molecularly-bonded hydrophilic groups – sustained water content for long-lasting comfort. Less raw silicon – a more flexible lens for a softer, more comfortable wearing experience. 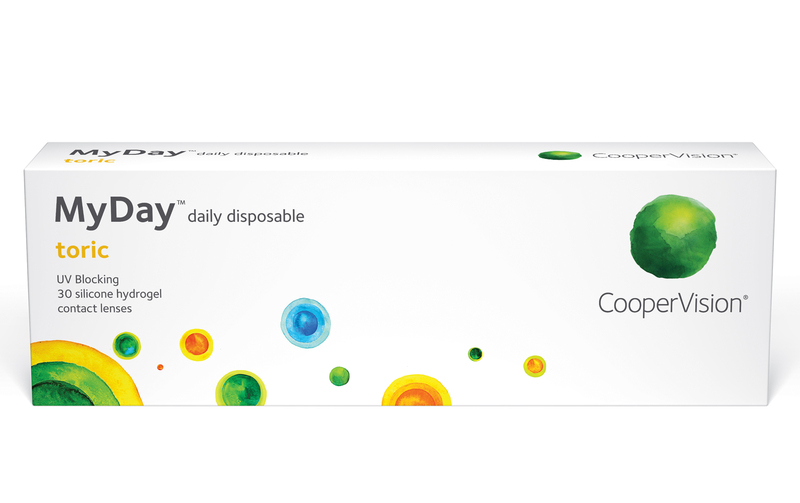 Talk to your astigmatic patients about the exceptional vision and unsurpassed comfort of MyDay® toric daily disposable contact lenses - an excellent choice for new patients and an easy upgrade for your current hydrogel lens wearers. To help promote long-term ocular health, MyDay® toric lenses’ built-in UV protection* filters 85% of UVA and 96% of UVB rays.